Welmin Beef Rumigest® provides a blend of minerals, trace elements and vitamins to support optimum liveweight gain. 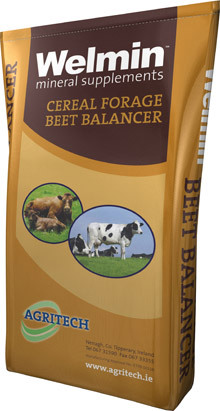 It is an ideal mineral for all beef stock, for inclusion in TMR diets, top dressed on silage or added to concentrate. 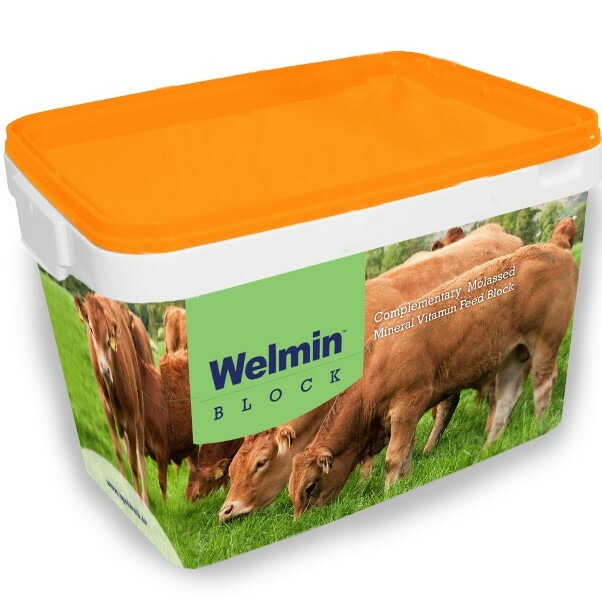 Welmin Beef Rumigest® is an essential supplement for young stock where low levels of concentrate are fed. Contains copper from multiple sources which both play an important role in the thrive of beef cattle, along with helping to ensure that female replacements reach puberty on time. Chelated zinc level helps prevent lameness during the indoor period. Beef Rumigest® contains high levels of iodine, which is an important part of Thyroxine, a naturally occurring growth regulating hormone. Beef Rumigest® has been shown to give excellent results to weanlings and is very cost effective. Welmin Beef Finisher provides a blend of minerals, trace elements together with high levels of vitamin E. It provides for optimum performance of the fattening animal in the finishing period. Welmin Beef Finisher with 6% phosphorous is the ideal balanced mineral for beef cattle on low phos diets. Chelated copper plays an important role in the intensive feedlot beef system. High chelated zinc level helps to prevent lameness during the indoor period. High levels of vitamin E allows for improved performance, better health and optimum resistance to disease, particularly important when feeding acid treated cereals where the vitamin E levels may be denatured. Contains Rumigest® yeast to allow rumen bacteria thrive and aid digestion of the intensively fed finishing animal. Welmin Multiboost is a supplement rich in macro and trace minerals along with a broad range of vitamins. Suitable for a wide range of animals including young stock, particularly replacement dairy heifers and calves, show animals, horses and also deer. Welmin Multiboost is heavily fortified with a broad range of vitamins, particularly the B vitamins essential for vigour and health in the young developing animal. Contains 8.5% oil from salmon oil and protected fats to give that extra thrive, vitality and sheen making it an ideal supplement for all show animals maintaining a healthy glow and suppleness to the skin. Copper, selenium and zinc from multiple sources for maximum bioavailability and thrive. Contains 4% phosphorus for improved growth and bone development. Farmers report excellent results when fed to their replacement dairy heifers during their first winter pre breeding. Welmin Super Thrive is a high specification block with high levels of macro and trace elements and vitamins. It is most suited to the demands of the growing animal as it provides valuable nutrients to ensure optimum growth and production. Copper and zinc levels from multiple sources including 34% chelated copper. High levels of vitamins including key B vitamins. To buy our Welmin Beef Mineral Supplements, contact your local distributor.